The third edition of this best-selling text has been revised to present a more problem oriented approach to learning Pascal, without substantially changing the original popular style of previous editions. 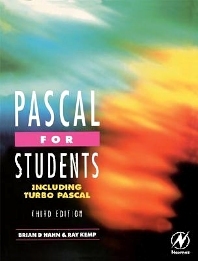 With additional material on Turbo Pascal extensions to the standard Pascal, including binary files and graphics, it continues to provide an introduction which is as suitable for the programming novice as for those familiar with other computer languages. First time learners of Pascal - undergraduates in mathematics, applied mathematics, physics, engineering and computing. Also of value to academics in other scientific disciplines who need to learn some basic programming. Introduction Section 1: Pre-defined Simple Types and Control Structures - First steps Comparisons and characters Repetition Conditional execution and transfers Subprograms Section 2: Structured and Enumerated Data Types - Arrays User-defined values, subranges and record structures Files Pointer structures Set structures and tackling a larger problem Section 3: Turbo Pascal - General Turbo Pascal extensions and exceptions Turbo Pascal files Turbo Pascal graphics Section 4: Mathematical Applications of Turbo Pascal - Simulation Matrices and their applications Introduction to numerical methods Appendices - Syntax diagrams Reserved words and required identifiers Required functions and procedures Turbo Pascal functions and procedures Common codes Portability Glossary Index.